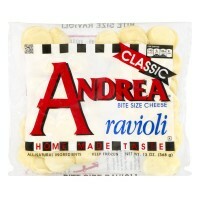 13 oz bag Andrea® Ravioli Cheese. Per serving: 140 Calories. 0g Sat fat, 0% DV. 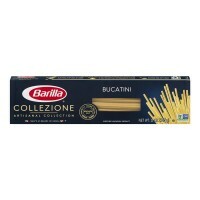 140mg Sodium, 6% ..
12 oz box Barilla® Pasta Bucatini. Artisanal collection. 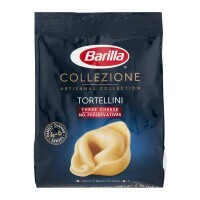 Bronze Cut - Perfectly holds s..
12 oz bag Barilla® Collezione Artisanal Collection Tortellini Three Cheese. 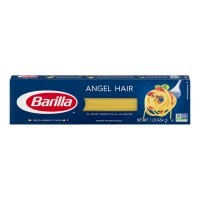 Italy's #1 ..
16 oz box Barilla® Pasta Angel Hair. 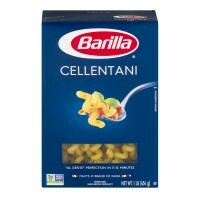 Italy's #1 brand of pasta.® "Al Dente" perfection ..
16 oz box Barilla® Pasta Cellentani. "Al dente" perfection in 11-12 minutes. Italy's #1..
16 oz box Barilla® Pasta Ditalini. N.45. "Al Dente" perfection in 10-11 minutes. 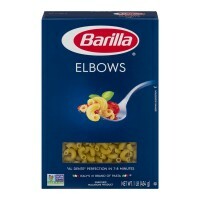 Italy'..
16 oz box Barilla® Elbows Pasta. Enriched Macaroni Product. 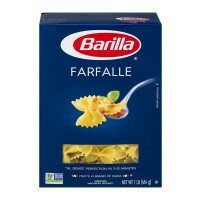 "Al Dente" perfection in 7-..
16 oz box Barilla® Pasta Farfalle. "Al dente" perfection in 11-12 minutes. Non GMO Proj..
16 oz box Barilla® Pasta Gemelli. N. 90. "Al Dente" perfection in 12-13 minutes. Italy's #1..
16 oz box Barilla® Pasta Linguine. Italy's #1 Brand Of Pasta®. 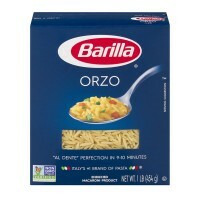 "Al dente" perfection in..
16 oz box Barilla® Pasta Orzo. "Al dente" perfection in 9-10 minutes. Italy's #1 brand of p..
12 oz box Barilla® Pasta Pastina™. "Al dente" perfection in 6-7 minutes. Italy's #1 brand o..
16 oz box Barilla® Pasta Penne. "All dente" perfection in 11-12 minutes. Italy's #1 bra..
16 oz box Barilla® Pasta Rigatoni. "Al Dente" perfection in 12-13 minutes. Italy's #1 B..
16 oz box Barilla® Pasta Mezzi Rigatoni. "Al Dente" perfection in 10-11 minutes. 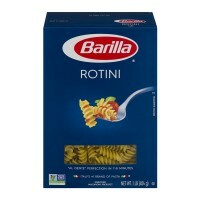 Italy'..
16 oz box Barilla® Pasta Rotini. "Al dente" perfection in 7-8 minutes. Italy's #1 Brand..
12 oz box Barilla® Pasta Tri-Color Rotini. NON GMO. "Al Dente" perfection in 7-8 minute..
16 oz box Barilla® Pasta Spaghetti. Italy's #1 Brand of Pasta®. "Al dente" perfection i..
16 oz box Barilla® Pasta Thin Spaghetti. Italy's #1 Brand of Pasta®. 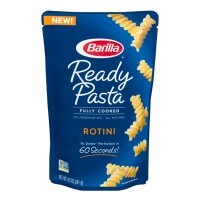 "Al Dente" perfection in 6-7..
8.5 oz pkg Barilla® Ready Pasta Fully Cooked Rotini. New! No preservatives. All natural. 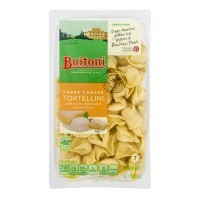 "A..
9 oz pkg Buitoni® Tortellini Three Cheese. 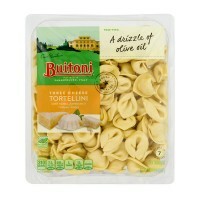 Serve with: Grape tomatoes, yellow bell pepp..
20 oz pkg Buitoni® Tortellini Three Cheese. Est. 1827. Inspired in Sansepolcro, Italy. 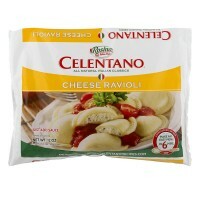 ..
12 oz bag Celentano® Cheese Ravioli. Rosina®. Real Italian Style™. 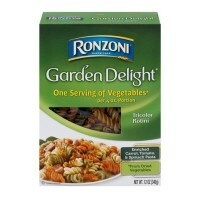 All natural Italian ..
12 oz box Ronzoni® Garden Delight® Tricolor Rotini. Since 1915. 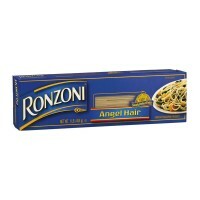 One serving of vegetabl..
16 oz box Ronzoni® Enriched Macaroni Product Angel Hair. Simply Perfect Pasta. 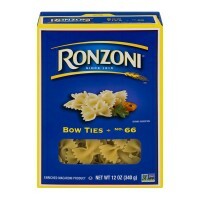 We have ..
12 oz box Ronzoni® Bow Ties No. 66. Since 1915. Enriched macaroni product. 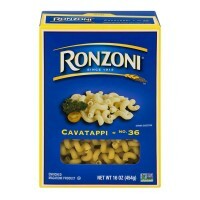 Non GMO proj..
16 oz box Ronzoni® Cavatappi No. 36. Since 1915. Enriched macaroni product. 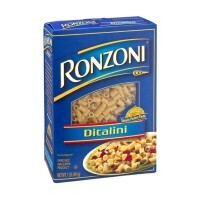 Non GMO pro..
16 oz box Ronzoni® Enriched Macaroni Product Ditalini. Simply Perfect Pasta. 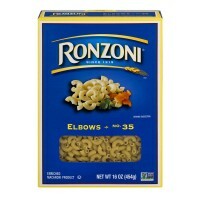 We have be..
16 oz box Ronzoni® Elbows No. 35. Since 1915. Enriched macaroni product. 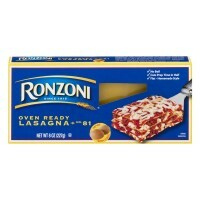 Non GMO projec..
8 oz box Ronzoni® Oven Ready Lasagna No. 81. Since 1915. No boil. 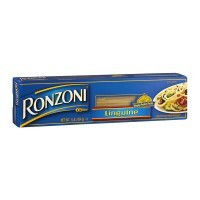 Cuts prep time in hal..
16 oz box Ronzoni® Linguine. Simply perfect pasta™. Enriched macaroni product. 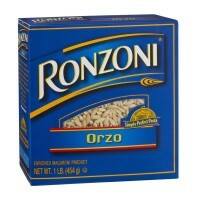 We have ..
16 oz box Ronzoni Enriched Macaroni Product Orzo. Simply Perfect Pasta. 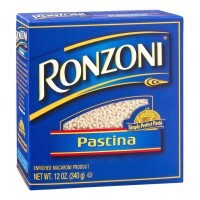 We have been tr..
12 oz pkg Ronzoni® Enriched Macaroni Product Pastina. Simply Perfect Pasta. 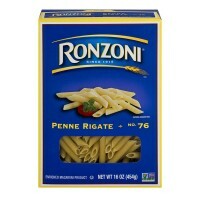 We have been tr..
16 oz box Ronzoni® Penne Rigate No. 76. Since 1915. Enriched macaroni product. 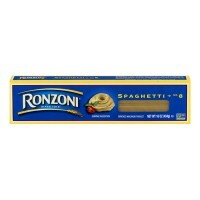 Non GMO Proj..
16 oz box Ronzoni® No. 27 Rigatoni. Since 1915. Enriched macaroni product. 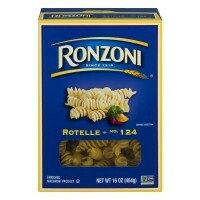 Non GMO proj..
16 oz box Ronzoni® Rotelle. Since 1915. No 124. Enriched macaroni product. 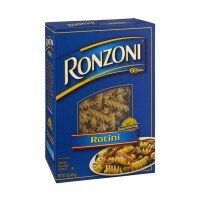 Non gmo proj..
16 oz box Ronzoni® Rotini. Simply perfect pasta.™ Enriched macaroni product. 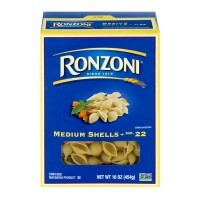 For delicious ..
16 oz box Ronzoni® Medium Shells No. 22. Since 1915. Enriched macaroni product. 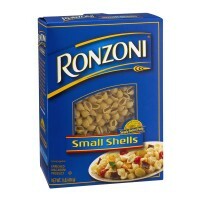 Non GMO..
16 oz box Ronzoni Enriched Macaroni Product Small Shells. Simply Perfect Pasta. 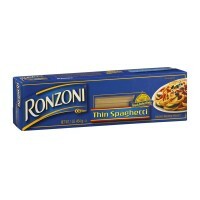 We have bee..
16 oz box Ronzoni® Spaghetti No. 8. Since 1915. Enriched macaroni product. 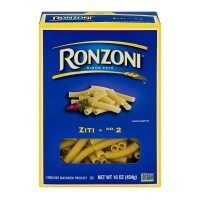 Non GMO proj..
16 oz box Ronzoni® Enriched Macaroni Product Thin Spaghetti. Simply Perfect Pasta. 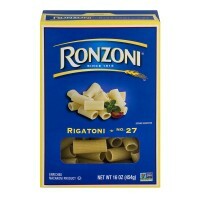 We h..
16 oz box Ronzoni® Ziti No. 2. Since 1915. Enriched macaroni product. Non GMO project. 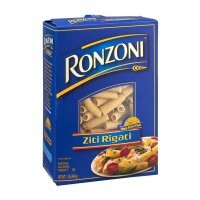 ..
16 oz box Ronzoni Enriched Macaroni Product Ziti Rigate. Simply Perfect Pasta. We have ..